Workhouses existed at Totnes from around 1738, and at Ugborough from 1739 (Hitchcock, 1985). A parliamentary report of 1777 recorded parish workhouses in operation at Totness (for up to 40 inmates), Berey Pumerey (40), Brixham (60), Cornworthy (40), and Staverton (30). Brixham had a parish workhouse on what was then called Beggar's Hill — now "Baker's Hill". 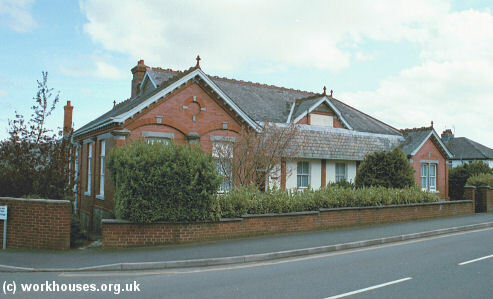 The building later became Baker's Hill school. Devon: Ashprington, Berry Pomeroy (2), Brixham (4), Buckfastleigh (3), Churston Ferrers, Cornworthy, Dartmouth - St Petrox, Dartmouth - St Saviour (3), Dartmouth Townstall (2), Dittisham, Diptford, Dean Prior, Dartington, Halwell, Holne, North Huish, Harberton (2), Kingswear, Little Hempstone, Morley, Marldon, Paignton (2), Rattery, Staverton, Stoke Gabriel, South Bent (2), Totnes (4), Ugborough (2). The population falling within the Union at the 1831 census had been 32,340 — ranging from Morley (population 182) to Brixham (5,015) and Totnes (3,442). The average annual poor-rate expenditure for the period 1834-36 had been £13,879 or 8s.7d. per head of the population. The workhouse originally had an entrance block fronting onto the road which contained the Guardians' board-room, porter's and clerk's rooms, receiving wards and so on. The main workhouse building was of three storeys with a semi-octagonal projection at the centre. An small additional wing was later added at the east, possibly containing female sick wards. 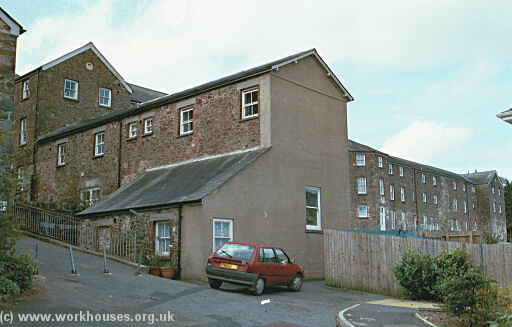 Totnes main block from the north-east, 2001. Totnes main block entrance from the north, 2001. In 1871, an infectious ward block was erected at the south of the site. Totnes infectious ward block from the north, 2001. In 1894, the British Medical Journal set up a "commission" to investigate conditions in provincial workhouses and their infirmaries. Following a visit to Totnes, the commission's report included a number of criticisms: all that went on in the lying-in ward could be heard through the partition separating it from the old women's ward; the sanitary appliances all over the house were antiquated; the baths seemed to be rarely used and some were potentially dangerous; new and more comfortable bedsteads were needed for the old people. None of the three nurses was hospital trained, and there was no night nurse. A "ward tender" — usually an old inmate — was appointed to each ward, and these seemed to do much of the nursing. Further details are available in the full report. In 1909, the entrance block was replaced by a two storey red-brick block (now demolished) which housed an 80-bed infirmary with nurses' accommodation, pluse a new porter's lodge and receiving wards. The Guardians' board-room was relocated to a separate new building on the opposite side of the road. The new layout is shown on the 1933 map below, by which time the workhouse had become redesignated as a Public Assistance Institution. Totnes 1909 infirmary block from the north-east, 1993. 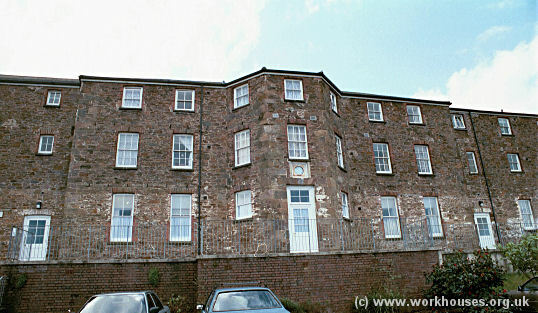 Totnes board-room block from the south-west, 2001. 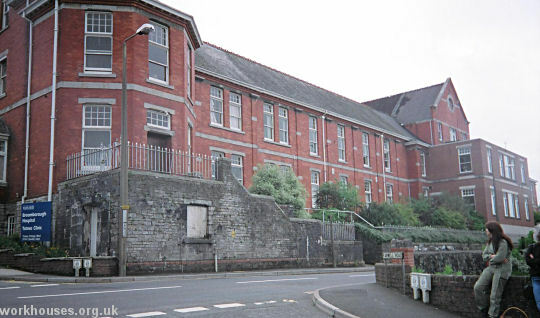 The workhouse later became Totnes Public Assistance Institution and then Broomborough Hospital. The surviving buildings have now been converted for residential use. Devon Heritage Centre, Great Moor House, Bittern Road, Sowton Exeter EX2 7NL. Virtually no local records survive. German, Anne (1986) The Land of Goschen - Life in the Totnes Workhouse 1869-1870 , Totnes Community Archive. Manton, L (1986) Scandal in the Workhouse , Totnes Community Archive.